The geodesic landmark marks a half-century with good movies galore. 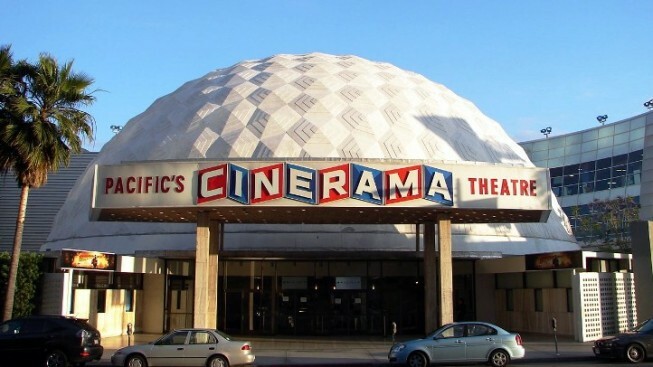 It all started in 1963: The Cinerama Dome turns 50 this fall with a helping serving of sweet cinematic classics. If you've been inside a movie theater at any point during the last five years, and you've arrived ten or fifteen minutes before the start time, you've seen one thing: Nearly everyone in the audience staring down at their hands. Their faces, of course, are illuminated by a glowing rectangle and their eyes? Firmly fixed downward. But a theater does exist where stare-at-my-phone-itis is not so rampant: The Cinerama Dome. It's difficult to be too distracted in the famous venue, and you're just as likely to see people looking up at the beehive ceiling as down at the device in their hands. The Sunset Boulevard landmark has had a few years to learn how to impress, though: It's turning 50 this year, on Nov. 7, to be exact, and ArcLight Hollywood is bringing out the bells and whistles in its half-century'd honor. Or make that the whips, roses, and saddles. A number of notable past films are set to screen in honor of the geodesic wonder's anniversary, including "Raiders of the Lost Ark," "American Beauty," "Logan's Run," and "JFK." Spoiler alert: There shall be Q&As aplenty, of course, with luminaries involved with the flicks. And then there's two of the biggies, the biggie-iest of the biggies where the Dome is concerned: "How the West Was Won" and "It's a Mad, Mad, Mad, Mad World." The 1963 madcap, dash-for-cash classic was the Dome's very first film. And as for "West"? It "was filmed in the curved screen Cinerama process," so trust: It's a true treat to see it under the big beehive. The 50th Anniversary screenings kick off on Tuesday, Oct. 22. The film process and the Sunset screen are over a decade apart in age, but they're forever linked in the hearts, minds, and ticket-buying wallets of film fans. Fans who know the easy joy of staring up at all of those design-cool hexagons and pentagons to pass the pre-movie wait.